The Initiative on Diversity, Equity, and Learning (IDEAL) uses collaborations and strategic communication of research to assist policy makers, educators, the media, and the public in understanding research related to equity and racial diversity with the goal of advancing opportunities and school success for all students. Closing the Opportunity Gap brings together top experts who offer evidence-based essays that paint a powerful picture of denied opportunities. They also describe sensible, research-based policy approaches to enhance opportunities. W. Steven Barnett, Ph.D. is Director of the National Institute for Early Education Research and Board of Governors Professor of Education at Rutgers--The State University of New Jersey. His work focuses on early childhood policy. Clive Belfield is an Associate Professor of Economics at Queens College, City University of New York and a Research Fellow at Center for Postsecondary Education and Employment at Teachers College Columbia University. Barnett Berry is the founder and CEO of the Center for Teaching Quality, a research & advocacy non-profit dedicated to improving student learning by advancing the teaching profession. His most recent book, Teacherpreneurs: Innovative Teachers Who Lead, But Don¹t Leave, outlines a powerful vision for bold brand of leadership from those who teach students. Prudence L. Carter is Professor of Education and (by courtesy) Sociology at Stanford University. She is also the Co-Director of the Stanford Center for Opportunity Policy in Education (SCOPE). Professor Carter’s research and teaching expertise are in the areas of inequality and the sociology of education, with a particularly focus on race, ethnicity, class, gender, culture and identity. She is the author of the award-winning book, Keepin’ It Real: School Success beyond Black and White (2005) and Stubborn Roots: Race, Culture, and Inequality in U.S. & South African Schools(2012); and co-editor of Closing the Opportunity Gap: What America Must Do to Give Every Child an Even Chance. Linda Darling-Hammond is Charles E. Ducommun Professor of Education at Stanford University and co-director of the Stanford Center for Opportunity Policy in Education. Her most recent book, recipient of the Grawemeyer Award, is The Flat World and Education: How America’s Commitment to Equity will Determine our Future. Patricia Gándara is Professor of Education and Co-Director of the Civil Rights Project/Proyecto Derechos Civiles at the University of California at Los Angeles. Her most recent book is The Latino Education Crisis: The Consequences of Failed Social Policy. Harvey Kantor is a Professor, and the Director of Graduate Studies, at Department of Education, Culture, and Society at the University of Utah. His research focuses on the history of education and social policy. Gloria Ladson-Billings is the Kellner Family Chair of Urban Education in the Departments of Curriculum & Instruction, Education Policy Studies, and Afro-American Studies at the University of Wisconsin-Madison. Dr. Cynthia Esposito Lamy is Metrics Manager at the Robin Hood Foundation where she develops measures of the benefits of social programs. Her background is in developmental and educational psychology, focusing especially on children at risk of school failure due to poverty. Henry M. Levin is the William Heard Kilpatrick Professor of Economics and Education, Teachers College, Columbia University and the David Jacks Professor of Higher Education and Economics, Emeritus, Stanford University. He is a specialist in the Economics of Education. Daniel J. Losen is director of the Center for Civil Rights Remedies, a new initiative at the Civil Rights Project/Proyecto Derechos Civiles (CRP). He has worked at the Civil Rights Project since 1999, when it was affiliated with Harvard Law School, where he has also been a lecturer on law. Both for The Civil Rights Project, and independently, he provides guidance to policymakers, educators and advocates at the state and district level. Before becoming a lawyer, Mr. Losen taught in public schools for ten years, including work as a school founder of an alternative public school. Robert Lowe is Professor of Education at Marquette University. He studies the history of American education. Michele S. Moses is Professor of Educational Foundations, Policy and Practice at the University of Colorado Boulder. She specializes in philosophy and education policy studies, with particular expertise in higher education policy issues related to race, class, and gender, such as affirmative action and equal opportunity policies. Gary Orfield is Professor of Education, Law, Political Science & Urban Planning and Co-Director of the Civil Rights Project/Proyecto Derechos Civiles at the University of California at Los Angeles. John Rogers is an Associate Professor in UCLA’s Graduate School of Education and Information Studies and the Director of UCLA’s Institute for Democracy, Education and Access (IDEA). He studies the role of public engagement in equity-focused school reform and civic renewal. Richard Rothstein is a research associate at the Economic Policy Institute, and senior fellow at the Chief Justice Earl Warren Institute on Law and Social Policy at the University of California (Berkeley) Law School. His books include Class and Schools and Grading Education. Janelle Scott is an Associate Professor at the University of California at Berkeley in the Graduate School of Education and African American Studies Department. Her research explores the relationship between education, policy, and equality of opportunity, and centers on three related policy strands: the racial politics of public education, the politics of school choice, marketization, and privatization, and the role of advocacy in shaping public education. Christopher H. Tienken is an assistant professor at Seton Hall University, Department of Education Leadership, Management and Policy. His research interests include curriculum and assessment policy. He is the editor of the Kappa Delta Pi Record and the AASA Journal of Scholarship and Practice. Karolyn Tyson is Associate Professor of Sociology at the University of North Carolina at Chapel Hill. Her research focuses on understanding educational structures and processes that contribute to inequality. Amy Stuart Wells is a professor of Sociology and Education at Teachers College, Columbia University and the Director of the Center for Understanding Race and Education (CURE). Her research focuses broadly on the relationship between race/ethnicity and educational opportunities across an array of public policies. Kevin G. Welner is a professor of education at the University of Colorado Boulder School of Education and the Director of the National Education Policy Center. His work examines the use of research in policymaking, the intersection between education rights litigation and educational opportunity scholarship, and the school change process associated with equity-focused reform. Yong Zhao is Presidential Chair and Associate Dean at the College of Education, University of Oregon. He is also a professor at the Department of Educational Methodology, Policy, and Leadership. His current research focuses on the implications of globalization for education. Our authors and experts put together this list of policies to help policy makers and their staffs get started on closing the Opportunity Gap. Here are several examples of how communities around the country are making progress closing the Opportunity Gap. 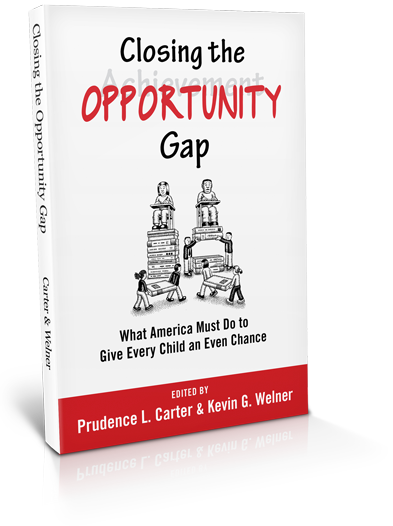 Access more information about “Opportunity Gap: What America Must Do to Give Every Child an Even Chance” published by Oxford University Press here. Appleseed asks parents, educators and school board members to take action to make schools more equitable across the nation. Arc is an after school and experiential education provider in southern California. We create transformational learning opportunities that empower youth to realize their full potential. Animated short about SMASH Academy and its ability to close the opportunity gap through STEM education. Schools for Equity in Education (SEE) video explaining the opportunity gap in Minnesota's public education funding system. Schooling, at its best, is about creating new futures for our children. Closing the Opportunity Gap describes education as it is and provides a vision of education as it should be. The book provides a powerful critique of the educational and social policies and practices that exacerbate the widening economic disparity between rich and poor and the growing opportunity gap for too many of our nation's youth. The authors' analyses of educational inequity and their focus on opportunity to learn offer a much needed blueprint and a new social imagination about schooling in the U.S.
As policymakers and education leaders seek to pick up the pieces of a public education system tattered by No-Child-Left-Behind style reform, Carter and Welner's book brings clear-eyed analyses of failure and of future possibilities. In one highly readable volume, the nation's leading scholars provide evidence-based accounts of the root causes, everyday realities, and long-term consequences of the nation's weightiest educational problem-profound inequality in and out of school. And, most important, they offer comprehensive, insightful, and useful remedies. Those seeking new concepts and strategies for creating the public schools our diverse nation desperately needs and deserves need look no further than this astonishing book.